WASHINGTON— The yearly count of monarch butterflies overwintering in Mexico, released today, shows an increase of 144 percent from last year’s count and is the highest count since 2006. 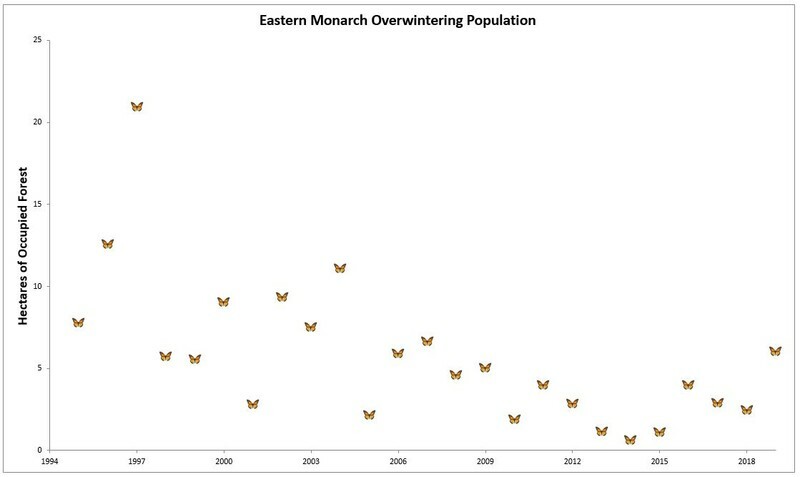 That’s good news for a species whose numbers had fallen in recent years, but conservationists say the monarch continues to need Endangered Species Act protection. Today’s count of 6.05 hectares of occupied forest is up from 2.48 hectares last winter. The increase is attributable to favorable weather during the spring and summer breeding seasons and during the fall migration. Monarchs have lost an estimated 165 million acres of breeding habitat in the United States to herbicide spraying and development. In 2014 conservationists led by the Center for Biological Diversity and the Center for Food Safety petitioned the U.S. Fish and Wildlife Service to protect the butterfly under the Endangered Species Act. The Fish and Wildlife Service’s initial decision was that endangered species protection may be warranted, and a final decision will be issued by June. Climate change also threatens to disrupt the monarch’s migration and render its overwintering habitats unsuitable by the end of the century. Graph by Tierra Curry, Center for Biological Diversity. This image is available for media use.